Tragedy – What if it happened to me? Tragedy always seems to happen somewhere in the world; like an earthquake destroying buildings, someone running amok with a dangerous firearm, or civil populations of non-combatants affected by weapons of war. Watching the television news you wonder ‘What if it ever happened to me?’ It is so easy for the innocent to suffer damage to limbs, destroyed home, or even death of family members. A tragedy might so radically change your life that you would lose your means of earning a livelihood or other important roles. Even an ordinary event might be personally catastrophic. 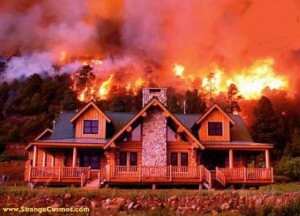 In 2002 a forest fire made over 2,000 families homeless in one county in California. By 2006 many homes had been rebuilt. One couple, Jim and Maureen, moved into their replacement home with their teenage son after four years living in makeshift temporary accommodation. However, they were then faced with a higher adjustable-rate mortgage. On top of that, Jim was obliged to close his business which had been affected by the fire. Selling their rebuilt home and downsizing became the preferred option but the housing market had changed. Buyers had become wary about living in fire-ravaged areas, even if the rebuilt homes included sprinklers, tile roofs and other protective measures and so property prices dropped. The tragedy was that having failed to make loan repayments for several months and receiving no offers on the vacant property, the couple not only expected repossession of their home by their mortgage lender with a cheap sale of their only asset, but also faced the prospect of bankruptcy. All this just shows the fragility of the things of the world that one takes for granted. Previously and without realising it, you had assumed that bodily and material things were permanent features of your life. You thought they sustained you and that you could not do without them. However, seeing personal effects of tragedy like the plight of people like Jim and Maureen, made me realise how transient such things really are – here today and gone tomorrow. A personal calamity would throw anyone upside down so that they feel in utter turmoil. Our comfort zone would be no longer available. The blow is harder to take if we had unwittingly assumed that whatever it was that we loved would always be there. We feel like shouting out `It’s not fair’. `It’s not the way things are supposed to be’. So what happens next? One thing some victims of catastrophe report is that although they may have become immobilised by a disastrous change in their outward circumstances, gradually they began to realise that is they themselves that really needed to change if a new happiness is to be found. You won’t always be able to carry on blaming others and fate for what has happened. So, you may decide just to get on with things remembering that ‘when the going gets tough, the tough get going.’ We are never too old to move with the times, never so beyond it that we cannot adapt and find new things, new people, new relationships. It may sound unbelievably harsh to ask this, but is it possible that a personal tragedy brings it home to us that divine realities like compassion, belonging and courage, are the enduring bedrock of our life? Are the things of the world, we previously valued so highly, mere illusions of happiness? After all, no worldly loss can damage things of the spirit – things like consideration for others, pulling together, and trying to be positive in the face of adversity. If things we see and touch cannot be relied on, what about things we cannot? Heaven is one such idea. If it is true that the kingdom of heaven is within ’ (Luke 17:21) then we are all capable of experiencing heaven in our daily lives. Is it not an inner state of mind? A spiritual reality that our bodily senses cannot detect? A very real and permanent feature to human life that physical events cannot harm? Our confidence can start to increase a little as we see a heavenly state of heart and mind motivating the efforts of rescue workers in flooded areas; leading the deliberations of planners and politicians to be better prepared in places at risk, like for example setting up a world-wide Tsunami early warning system ; and giving those suffering loss, some comfort and financial expectation that they can recover their lives. Even though we cannot see or touch heaven, becoming more conscious of this state of mind inspires us and fills us with hope. We cannot take the things of the world with us when we die; only things of the spirit. I would argue that this shows that spiritual reality is more permanent and safe from destruction than what is merely physical; for a worldly disaster cannot destroy heaven. Rather, we find what is indestructible interiorly within ourselves if only we would look for it. Source of life – Gives hope in adversity?